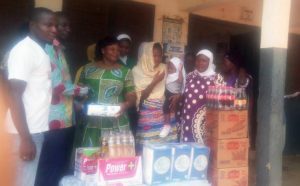 The Convention People’s Party (CPP) has provided assorted items to the Kanvili health centre in the Northern Region. The items included cartons of soft drinks, boxes of cerelac and diapers. A group calling itself Forum for rebuilding the Convention People’s Party (CPP) spearheaded the kind gesture as part of activities marking the CPP’s 69th Anniversary. The party’s 2016 Parliamentary candidate for Tamale Central, Dr. Abubakari Abdulai Madugu presented the items to management. He described the Forum as a rejuvenated youth wing of the CPP in the northern region poised to reorganize the party for the 2020 elections. He said the Kumbungu and the Mion Parliamentary seats will be their main targets. According to Dr. Madugu, the CPP will soon smoke out people who are pretending to be Nkrumaists while flirting with the New Patriotic Party (NPP) and the National Democratic Congress (NDC). The post CPP supports Kanvili health centre appeared first on Citi Newsroom.